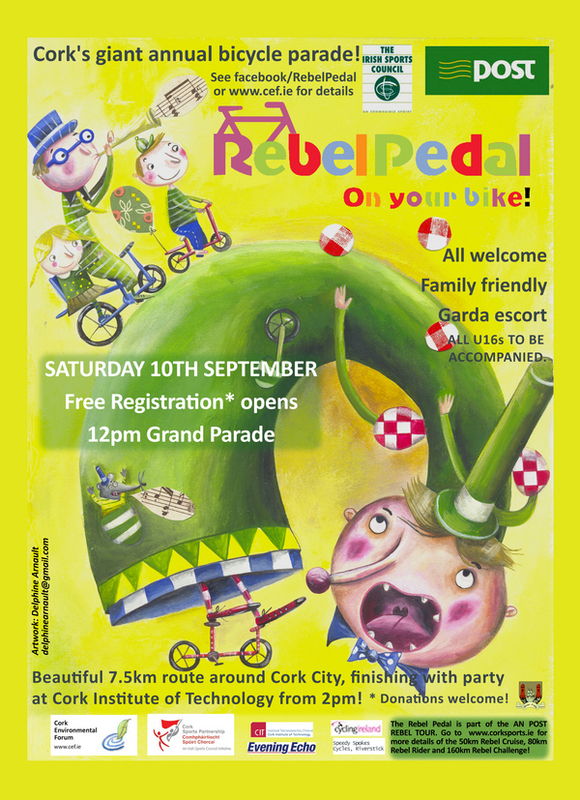 The Rebel Pedal is Cork’s iconic annual bicycle parade hosted by the Cork Environmental Forum in association with Cork City Council and Cork Sports Partnership. The event has been a regular feature since 2000, originally set-up as an event to highlight Car Free Day it evolved in support of European Mobility week. 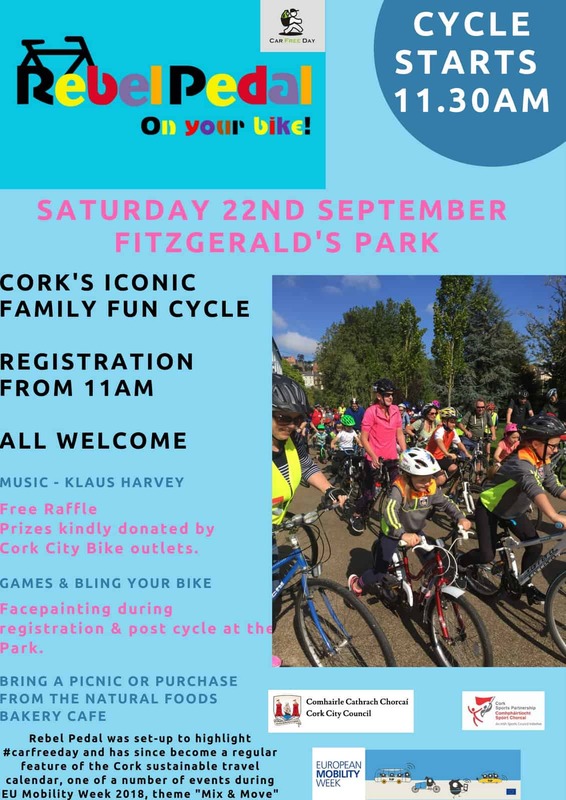 This event highlights the positive aspects of cycling as an easy, healthy, joyful and family-oriented activity as well as a convenient means of transport in Cork City. The 45 minute parade starts and finishes at Fitzgerald’s Park, followed by a picnic and entertainment including music, face-painting, a bike doctor and games. Friends and family are welcome to join in the afternoon relaxation and enjoyment. The Annual Family Fun Cycle & Picnic takes place on Sunday 18th September. Join us for what is always a really enjoyable event, the cycle will start and finish from the new location of Fitzgerald’s Park. The leisurely cycle will take us along the quays and through the three main streets of the city, Patrick Street, South Mall and Oliver Plunkett Street. Followed by entertainment by the Good Rain and some activities and games. Bring a picnic or purchase refreshments from the Natural Foods Bakery. Studies indicate that cities that promote sustainable transport are at a significant economic advantage over those that favour traditionally fuelled cars. From a governmental standpoint, investing in infrastructure for active travel, encouraging public transport use to reduce traffic congestion, and supporting bike-to-work schemes can save public money and boost local commerce. From every angle, the economic benefits of smart mobility are plain to see – from the public to the private sector, from society at large to the individual. This year, EUROPEANMOBILITYWEEK is encouraging both local politicians and the public to look at smart and sustainable mobility as an investment for Europe. It’s Rebel Pedal time again. Hopefully the sun will shine and we encourage you to come along and enjoy the sights and sounds of our lovely city on a bike! Anyone and everyone is welcome on the cycle – experienced cyclists and those who will dig out an old bike from the garage or borrow one. One proviso is that children would be able and comfortable cycling without stabilisers. The Gardai also recommend that helmets be worn. Registration commences from 11am at the Grand Parade with the Lord Mayor, seeing the cycle parade off at 12pm. There will be some facepainting and blinging of bikes during registration. A limited number of Rebel Pedal bags with some treats and hi-vis vests will be given out, do come & register early. The 6.15 km cycle will take in a range of city streets commencing from the Grand Parade and heading down the South Mall continuing along the quays, taking in some of the new cycle path on Pope’s Quay then making its way back to the South Mall via South Main street and Washington Street with the final leg going down Centre Park Road and ending at the Marina with a post pedal picnic near the Atlantic Pond -see full details following. The fun cycle around the city will be followed by the traditional picnic at the Atlantic Pond. This year the musical entertainment will be provided by the Good Rain with an eclectic mix for all tastes. There will be workshops and facepainting as well as refreshments from the unique EcoBus Café and delicious ice cream form the Natural Foods Bakery ice-cream bike! Do bring along games, frisbees and balls to play with. There will be more details and a number of reminders about the event but check out the website www.cef.ie and the Operation Transportation Facebook page www.facebook.com/operationtransportation for updates. There will also be a raffle with prizes kindly donated from some of the bike shops. Cork’s largest and most iconic Family Fun Cycle through the city, the Rebel Pedal marks the seasonal end to the family and fun orientated cycling events with an emphasis on cycling as a sustainable means of transport, including Mix Your Mode in March, Bike Week in June and the Cycling Festival in July. The event has been a regular feature since 2000, originally set-up as an event to highlight European Car Free Day it evolved in support of European Mobility week. This year’s European Mobility Week slogan, “Our streets, our choice!, reflects the fact that our streets are there to be used by us all and with respect to our mobility choices. It is a reminder that we all have a choice, and that changes such as commuting by bicycle rather than taking the car, opting for public transport, or choosing to walk, can enhance our quality of life and bring more vibrancy to our streets. Marion McCartneyorganiser of the “Dream the Future” arts project – which focuses on collecting people’s visions for a positive future happens to be visiting Cork and will have a Pop Up stand and will hopefully be able to collect some visions of a positive future from Cork. Please go along and contribute your dream of the future. More information on Dream the Future. Do come and join us and we do encourage fancy dress and general exuberance! As always we appreciate the assistance and support form An Garda Siochana, Cork City Council, Cork Sports Partnership, the St. John’s Ambulance and the Bicycle outlets who donate prizes. A special thanks to all our volunteer stewards without whom the event could not take place. Apologies error with access on google link posted. Please go to theOperation Transportation Page to see all the pictures from Sunday – there are 4 albums, Getting ready, Facepainting & Blinging, Cycle through the city & Marina & Picnic Activities. CEF would like to thank everyone who contributed to making this another successful Rebel Pedal. We thanks the Lord Mayor, Cllr. Catherine Clancy for taking time out of her day to set the cyclists off. We appreciate the significant assistance and support form An Garda Siochana, Cork City Council, Cork Sports Partnership, Green Schools and the St. John’s Ambulance.We would like to thank The Bike Shed, Victoria Cross Cycles and City View Wheels for sponsoring prizes. Thanks to the Cork Academy of Music who went down a treat with the post pedal picnicers and to Will Flanaghan for a most entertaining show. To Louise and Niamh for the non-stop facepainting & to all who helped with blinging bikes! We appreciate the vendors Pompeii Pizza, Clonakilty Ice Cream and Bean & Gone who supplied the refreshments. To Andy for the pictures and to the other press photographers who covered the event. A special thanks to all our volunteer stewards without whom the event could not take place. Registration commences from 11am at the Grand Parade with the Lord Mayor, Cllr. Catherine Clancy seeing the cycle parade off at 12pm. There will be some facepainting and blinging of bikes during registration. There is also a promise from Chameleon of a Random Act of Beauty to be bestowed on all participants, so be prepared!! A limited number of Rebel Pedal bags with some treats and hi-vis vests will be given out, do come & register early. The cycle will take in the South Mall continuing down the quays then making its way back to the South Mall via Washington Street with the final leg going down Centre Park Road and ending at the Marina with a post pedal picnic near the Atlantic Pond -see full details following. There will also be a raffle with prizes from some of the bike shops. This year’s European Mobility Week slogan, “Clean air – it’s your move!”, reflects the power that citizens have to clean up air quality through their mobility choices. It is a reminder that we all have a part to play, and that even small changes, such as commuting by bicycle rather than taking the car, opting for public transport, or choosing to walk, can enhance our quality of life. As always we appreciate the assistance and support form An Garda Siochana, Cork City Council, Cork Sports Partnership, RSA (for the hi-vis), the Bicycle outlets who donate prizes and the St. John’s Ambulance. A special thanks to all our volunteer stewards without who the event could not take place. Do come and join us and we do encourage fancy dress and general exhuberance! Registration commences from 11am at the Grand Parade with the cycle leaving at 12pm. The fun cycle around the city will be followed by the traditional picnic at the Atlantic Pond. This year the musical entertainment will be provided by the Cork Academy of Music with an eclectic mix for all tastes. There will be workshops and facepainting, a special show from Monsieur Gusto as well as refreshments from the Pompeii Pizza, Clonakilty Ice Cream and beverages from Bean & Gone. There will be more details and a number of reminders about the event but check out the website and the Operation Transportation Facebook page for updates. As in previous years we are supported by An Garda Siochana, Cork City Council and Cork Sports Partnership in running this event. We also very much appreciate the participation of the St. John’s Ambulance First Aid Responders. The Lord Mayor, Cllr. Catherine Clancy, launched the Cork City Rebel Pedal event which is run by Cork Environmental Forum as part of European Mobility Week. In highlighting this year’s Mobility Week slogan, “Clean air – it’s your move!” the Mayor highlighted the power that citizens have to clean up air quality through their travel choices and encouraged people to join in this symbolic cycle. The Lord Mayor was joined at the launch by children from Blarney Street CBS and Beaumont schools, representatives from Cork Environmental Forum, the Cork Sports Partnership, Green Schools, Cork Community Bikes, UCC Campus Bikes and members of the Cork Academy of Music. 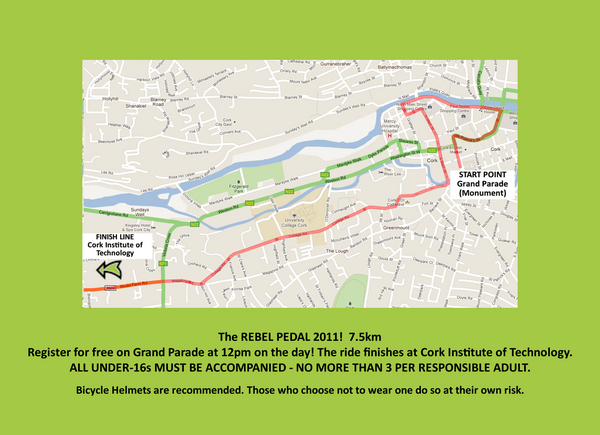 Rebel Pedal is Cork’s largest, most iconic and longstanding Fun Cycle, this year it takes place on Sunday 22nd September, at the Grand Parade at 12pm, registration will commence from 11am. There will be a post pedal picnic and entertainment at the Atlantic Pond. The Entertainment will include music from The Cork Academy of Music, Bike workshops, Face-painting, Bling your Bike etc. We also encourage people to bring along frisbees, balls and other outdoor games. Friends & family are welcome to join in the afternoon relaxation and fun. Bring a picnic or purchase from site vendors. Register for free from 12pm at the starting point on Grand Parade (Monument end). The ride will begin at 1pm and estimated arrival time at Cork Institute of Technology (where there will be food, music, games and hi-tech entertainments) is 1.45pm via a 7.5km route around the city centre. The Rebel Pedal is a free event, but it will be possible to make donations to the cause at the start line. Our much loved Rebel Pedal takes place as part of the An Post Rebel Tour again this year. On your bike! The first children’s workshop of 2011, hosted again by the Lifetime Lab. Twenty four lucky children made a giant monster installation out of items retrieved from their rubbish bins at home. The monster will appear in different locations throughout the summer! See the pictures here. Don’t believe us?! Check it out here! Featuring stories from Cork, Ireland and the world at large, this is Cork’s only daily paper dedicated to the environment. You can subscribe to have it delivered to your inbox every day in time for lunch – and it’s completely free. On Monday 21st March we co-hosted a launch of the new FEASTA publication ‘Fleeing Vesuvius; Overcoming the Risks of Economic and Environmental Collapse‘ in Cork Central Library. You can listen to David Korowicz’s fascinating talk here.